Located a short block south of campus, University Village and University Courts apartments provide convenient and affordable off-campus housing for BGSU students and faculty alike. It's a few minutes walk to the Student Recreation Center, the Library, the Musical Arts Center or choose the BGSU shuttle service with a stop on the corner. Shopping, restaurants, and other services are close by in the neighborhood. University Village offers spacious two bedroom apartments designed for shared occupancy with generous closet and storage space, excellent sound control, and private balconies. Architecturally pleasing buildings are situated on well landscaped grounds with a pond and green space for resident enjoyment. University Courts apartments for rent in Bowling Green, Ohio provides a quiet, cozy environment with buildings wrapped around two charming courtyards. One and two bedroom apartments with a choice of three floor plans are priced to accommodate single or shared occupancy. Contact us to set up an appointment! © 2015. 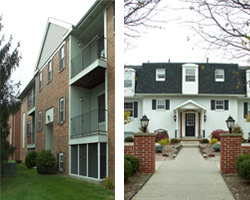 University Village & University Courts Apartments, 1520 Clough St, Bowling Green, Oh 43402, 419-352-0164. Fax: 419-354-3101.